Read the Autumn 2019 edition of Berg News by clicking here. Facebook page with full-length articles about our people, our environment, our businesses, and much more. Please click here to read the Autumn 2019 edition of Champagne News. We have compiled a comprehensive hiking checklist to assit you on your hike, be it a day hike or overnight hike. This checklist highlights the ten essential items that every hiker should carry. The food suggestions are our personal favourites from many hikes over the years, a little bit of luxury we think is deserved when hiking through these magnificant mountains. Before you go on any hike no matter how easy or short make sure your backpack has the ten essentials. When hiking you are responsible for your own safety and any one of these ten items may help to save your life. The total weight of your backpack will vary but should not be more than 20% of your bodyweight and 15% for children. 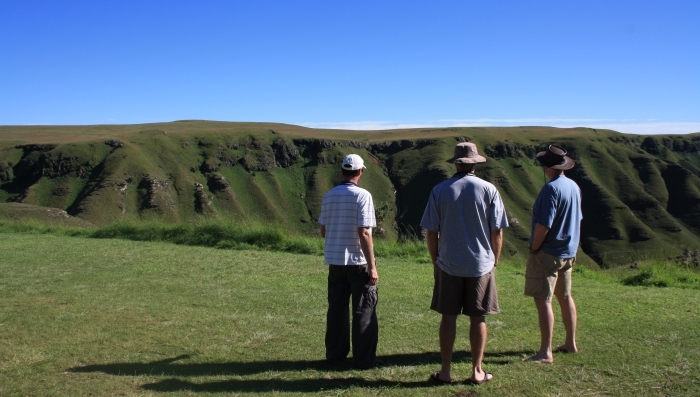 It's not often you have the option to hike to a lodge in Lesotho. 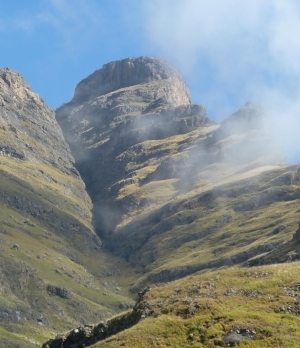 Your hike starts at Bushman's Nek and it's 20km to the lodge with an elevation gain of just over 1km. Along the route you go past Cedric's Pool, Tarn Cave, Irish Cave and what is known as Jonathan's Lodge (this lodge is being converted to a Museum). Once you reach this old lodge, you have the option of walking along the "road" which keeps to the mountain contours or a path (not always visible) which is more direct. 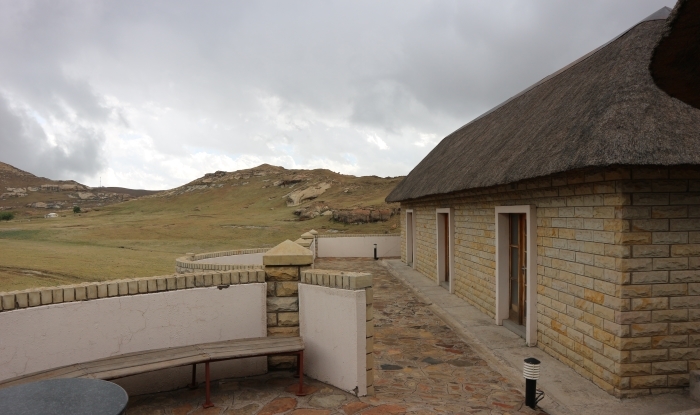 The lodge can accommodate up to 40 people (18 rooms) on a self-catering basis. 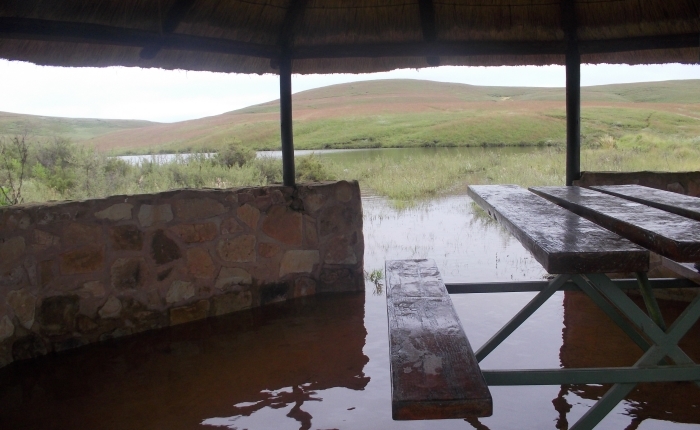 Camping with separate ablutions within the Lodge is also available. Contact details are +266 5899 7307 (Mabari Lebamang). The rates are R250 per person per night. The phone number above is the only way to currently make a booking, no emails are guaranteed to be received due to the remoteness of the location. You need to take your passport and get it stamped at Bushman's Nek before starting your hike and on your return. The gps track for this hike can be downloaded here. This gps track shows the "short cut" instead of going along the "road" from Jonathans lodge. If you feel unsure or it is misty then rather walk along the road to the lodge after reaching Jonathans lodge. The gps track if used and hike is at your own risk as per our standard disclaimer. What can we say, your adrenelin level definitely goes up, yes it's a bit scary and yes it's a lot of fun. Something people of all ages should try at least once. I did the canopy tour with my children and it was an absolute thrill, kids are fearless and keep us parents going till the end. The guides are friendly, helpful and very knowledgeable making the experience something you will never forget! 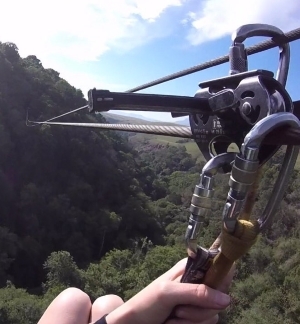 Boasting Africa’s first elevated rock face walkway with a good mix of both cliff face and treetop platforms, and cable slides over the forest up to 60 metres high, the Drakensberg Canopy Tour® must automatically go to the top of your “must do” list. 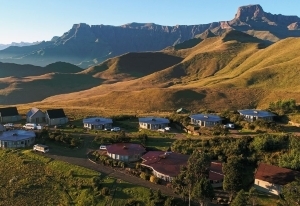 The inspiring nature of the majestic Drakensberg, the ancient indigenous forest, waterfalls and the cascading stream make this an opportunity not to be missed. The number of manufacturers and options when it comes to a hiking tent are seemingly endless and which is the "best" tent generally ends up being a personal preference. Our favourite is the Berghaus Peak 3.3 Pro Tent. The full specs can be viewed here. 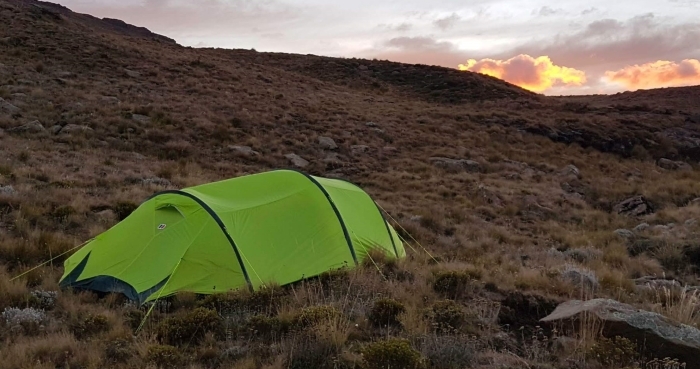 What makes this our tent of choice (we are not sponsored or paid, this is a personal opinion) is detailed below and will hopefully assist you when deciding on what to look for when buying a hiking tent. A 3-man tent that only weighs 2.9kg's (thus less than 1kg per person) with lots of space for 3 backpacks to also fit inside. 5000mm hydrostatic head and ground sheet. You won't find many tents that go above 3000mm. The tent has withstood winds in excess of 80km/h on the escarpment top (pic below shows the tent in 80km/h winds). It is a warm tent and copes well in the cold winter months. It only takes 5 minutes to pitch the tent. The tent can be pitched in the rain and the inside section stays 100% dry (double wall tent). Three colour coded lightweight alloy poles that can easily be replaced if damaged. Which tent do you have or would you buy? Mafadi/Ntheledi peak is the highest peak in South Africa @ 3450m. The original Sotho name Ntheledi meaning "Makes me slip", refers to the nearby stream and it is considered by some to be a more relevant and correct name. This is a 3 or 4 day hike and you need to be fit for this one. The most common route is to Centenary Hut on day one and then up Corner Pass or Judge Pass on day two. Sleep at Injisuthi Summit Cave (upper Injisuthi Cave) and summit Mafadi early on day three and then hike down Leslie's Pass and sleep at Marble Baths Cave. A short hike on the final day back to Injisuthi Campsite. The total hike is roughly 45km and 2.5km elevation gain. If planning to do this hike a guide is recommended. Hiking Guides can be viewed here and some of the scheduled guided hikes offered by hiking guides can be viewed here. If planning to go up the chain ladders and view the Amphitheatre and Tugela falls from above, then this is the perfect starting point. 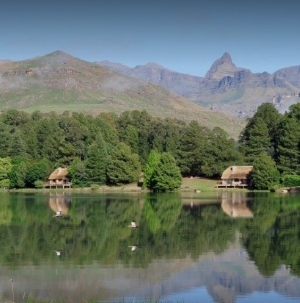 The lodge offers affordable Drakensberg accommodation, ideal for families, hikers, large or small groups visiting the area. Expect to enjoy spectacular views on all sides of the lodge and comfortable beds to welcome you after a day hiking. North Durban Schools' Principals recently attended a conference at Champagne Castle Hotel in the central Drakensberg. During their stay, they very kindly donated educational aids, stationery and books to the Drakensberg Experience Proud Schools Project. Below are pupils from Phumelelani Primary School and Mjwayeli Primary School with some of the donated items. Bambanani school is one of the schools in our Proud Schools Project. It is a small school with 420 pupils and is situated in the Northern Berg on the Dukuza road which runs from Bergville, behind Woodstock Dam and joins the Royal Natal road. There is no signboard to the school and it is off the main road, on a beaten track that looks as if it may just lead to some houses. The principal is incredibly enthusiastic and takes a great deal of pride in his school. The school was rebuilt many years ago and only one of the old classrooms remains but is in a shocking state. A look at the photographs below shows how the school grounds and gardens have been steadily improved over the last few years. Cannibals Cave parkrun recently celebrated their 3rd anniversary. Junior parkrunners joined in the celebrations and were delighted to receive their 10 club certificates signed by Bruce Fordyce.